The film has several miners getting laid off and being forced to find a new job. 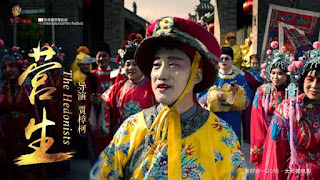 The trouble is that they are all middle aged guys with limited skill sets so they have to try things they are not suited for including body guard for a big shot (played by Jia Zhangke) and costumed actor at a period amusement park. A frequently laugh out loud film this is one of Zhangke's best most enjoyable films. Filled with sly humor and gorgeous crane (or is it drone ) shots this is a film that looks spectacular. There is also a sense that the director is having fun with a playfulness one doesn't always see in his work. Of course the film does have a serious side since it's clear its a commentary on the state of China's changing economy and not just a comedy about a bunch of guys looking for work. If there is a downside to the film at all is that it doesn't end so much as stop. When the end credits came up I stared at the screen quizzically wondering why the film ended there since there seems to be more to tell. I'm left to ponder if perhaps like many up and coming filmmakers Zhangke made the short in the hope of getting funding for a feature. You may think that is nonsense, but it's not since when I saw the director last year at NYFF he talked about the difficulty of getting funding for his projects. Abrupt ending or no the film is good enough to take a shot and try the International Auteurs collection the film is playing in at NYFF. Highly recommended.